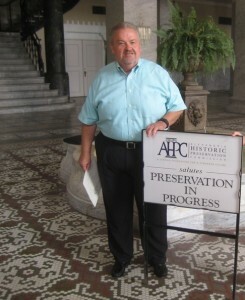 The AHPC is excited to announce the recipient of our July 2015 Preservation in Progress Award: Michael Jenkins for The Hotel Bentley. While its preservation is still “in progress,” due to the magnitude of the project, the award is well-earned. The ongoing renovation of the Hotel Bentley has not escaped the attention of the Alexandria-Pineville community due to the sheer size and presence of the hotel; its history and sophisticated architectural details are what so many residents and visitors value, not to mention its irreplaceable role in our downtown landscape. We’ve peeked into the double door lobby windows as the vacant building came back to life through the efforts of Mr. Jenkins and the many work crews that have rehabilitated this beloved landmark. It is now in its first stage of reopening as of May 2015 with the Mirror Room, a lounge on the ground floor. The Mirror Room has retained its name, despite the removal of the floor and ceiling mirror tiles due to damage from flooding and years of exposure to cigarette smoke. Vibrant original stained glass “salutation” windows are present, as well as the original marble bar and lounge scene mural. The next stage involves the opening of the fourth floor of hotel rooms. Michael Jenkins in Hotel Bentley lobby PIP award presentation The Hotel Bentley is a Renaissance Revival-style hotel. Built by the timber baron Joseph Bentley, it opened in 1908. It has played a vital role in the Alexandria-Pineville community, especially when it accommodated new residents and military officials during World War II. It was designed by George Richard Mann, who is also credited with the design of the 1909 City Hall building previously located across the street from the hotel. It was restored by Buddy Tudor in the 1980s to accolades of “its original splendor”. The hotel has been closed since 2004. View of lobby-webThe entire interior is being rehabilitated–fitted for changing or modern uses while retaining its historic appearance and character. “Unfortunately, we cannot do certain things that we would prefer such as increasing the size of the sleeping rooms and bathrooms, but we are doing the best that we can within the given parameters,” Mr. Jenkins remarked. The project must stringently follow the Secretary of the Interior’s Standards for Rehabilitation to receive Rehabilitation Tax Credits for which the project qualifies due to its National Register designation and status as a contributing structure within the “Original Town” historic district. Architectural features on the interior and exterior have been painstakingly treated, including the painting of coffered ceilings and the rotunda mural. All exterior features have been beautifully restored, maintaining the 1907 and 1937 appearances of the Bentley. While some interior changes were necessary, such as the replacement of the parquet floor with carpet in the Venetian Room, many of the original features remain, including the tile flooring, stained glass windows, two-story marble columns, ornamental relief panels, central marble staircase, and stately geometric railing. Simply walking through the grand loggia into the lobby produces a sense of overwhelming beauty and history. The seven-story 1937 Art Deco addition will house luxury condos. The 1908 section will remain a hotel with three floors of rooms. The hotel will also feature a Louisiana Maneuvers WWII exhibit on the lobby floor.